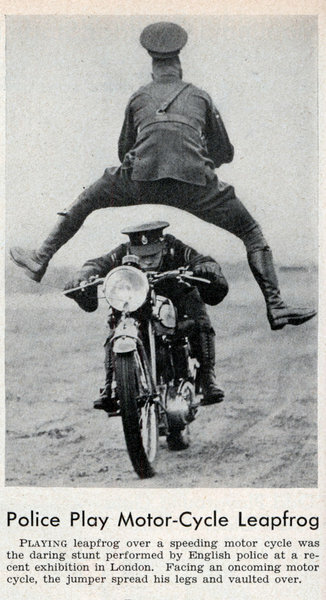 Police Play Motor-Cycle Leapfrog Playing leapfrog over a speeding motor cycle was the daring stunt performed by English police at a recent exhibition in London. 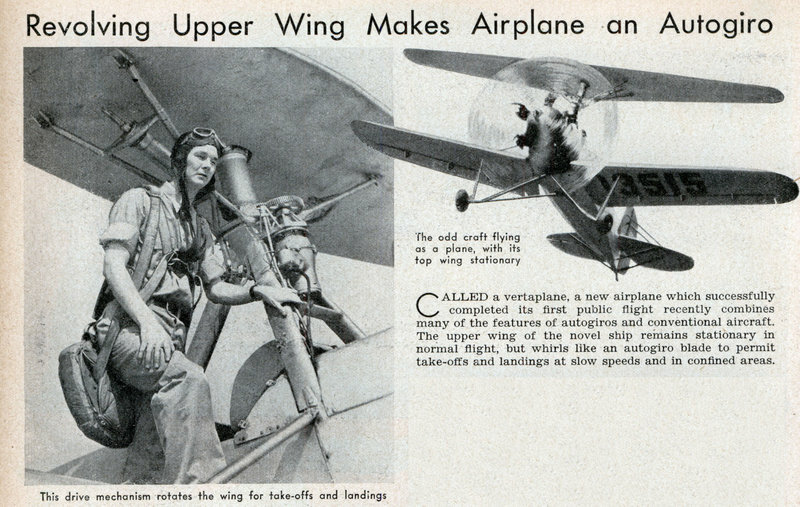 Facing an oncoming motor cycle, the jumper spread his legs and vaulted over. 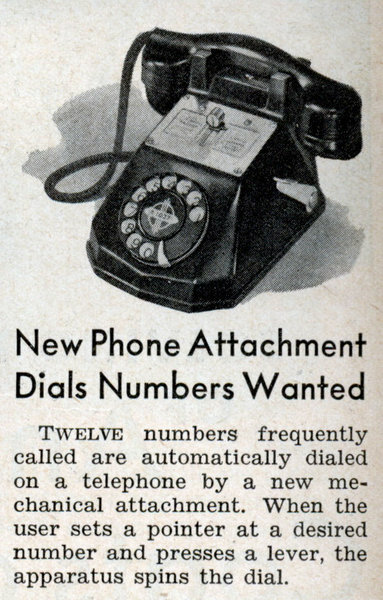 New Phone Attachment Dials Numbers Wanted Twelve numbers frequently called are automatically dialed on a telephone by a new mechanical attachment. When the user sets a pointer at a desired number and presses a lever, the apparatus spins the dial. Ready-Made House Costs $500 Equipped with a stove, refrigerator, window screens, dining table, couch, and other home accessories, a new type of prefabricated house costs less than $500. 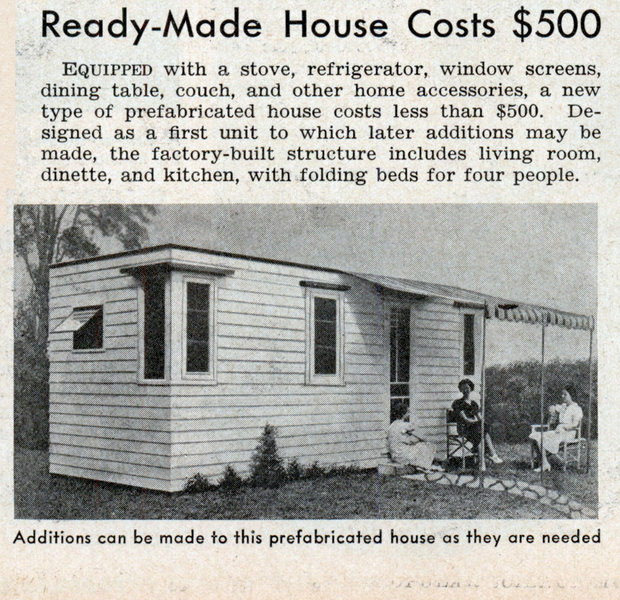 Designed as a first unit to which later additions may be made, the factory-built structure includes living room, dinette, and kitchen, with folding beds for four people. 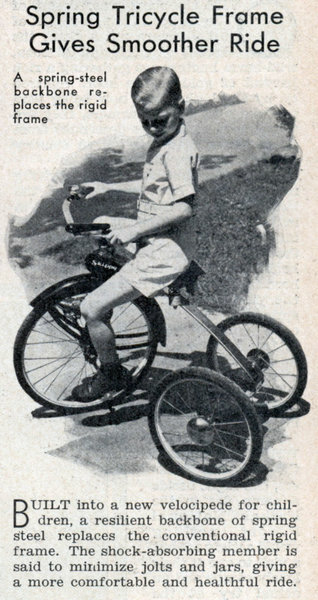 Spring Tricycle Frame Gives Smoother Ride BUILT into a new velocipede for children, a resilient backbone of spring steel replaces the conventional rigid frame. 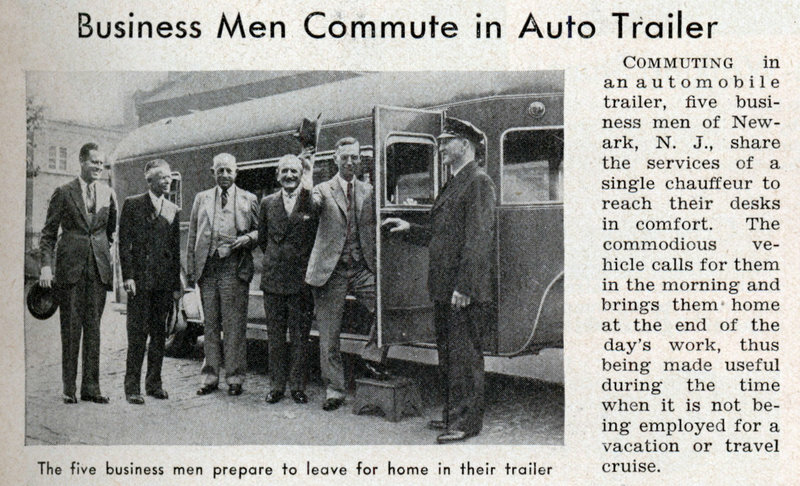 The shock-absorbing member is said to minimize jolts and jars, giving a more comfortable and healthful ride. 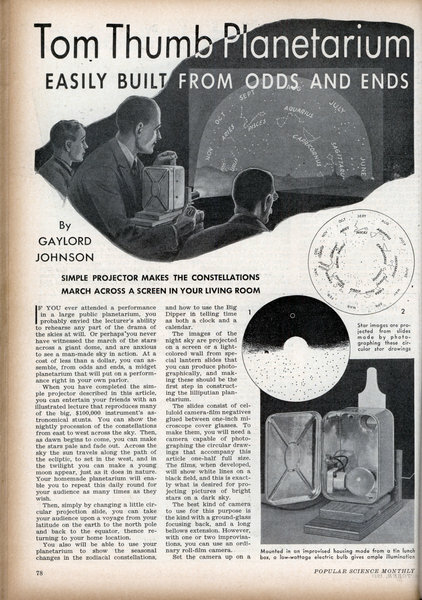 By GAYLORD JOHNSON SIMPLE PROJECTOR MAKES THE CONSTELLATIONS MARCH ACROSS A SCREEN IN YOUR LIVING ROOM IF YOU ever attended a performance in a large public planetarium, you probably envied the lecturer's ability to rehearse any part of the drama of the skies at will. Or perhaps you never have witnessed the march of the stars across a giant dome, and are anxious to see a man-made sky in action. 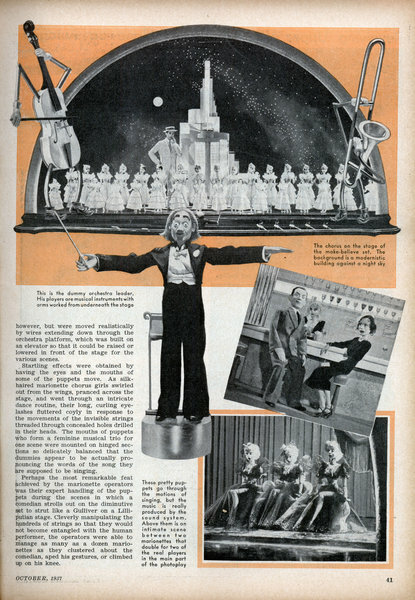 At a cost of less than a dollar, you can assemble, from odds and ends, a midget planetarium that will put on a performance right in your own parlor. 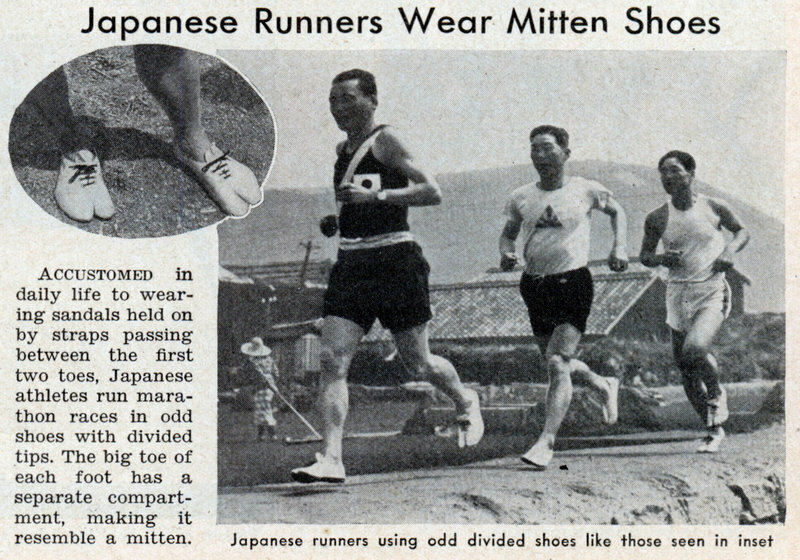 Japanese Runners Wear Mitten Shoes Accustomed in daily life to wearing sandals held on by straps passing between the first two toes, Japanese athletes run marathon races in odd shoes with divided tips. The big toe of each foot has a separate compartment, making it resemble a mitten. By PHILIP BAILEY MARIONETTES in the guise of chorus girls and movie stars dance and strut before a starlit background in one of the most novel scenes ever devised and filmed in Hollywood. 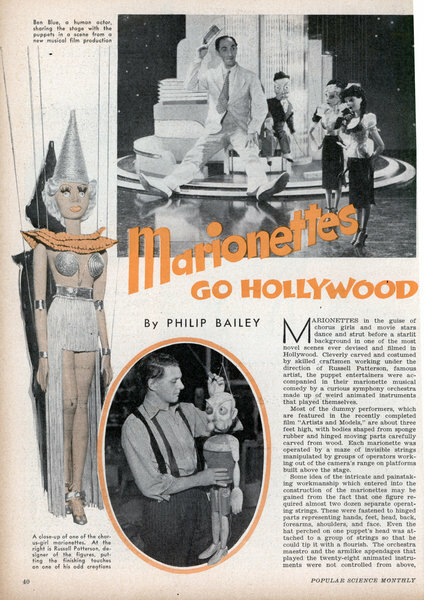 Cleverly carved and costumed by skilled craftsmen working under the direction of Russell Patterson, famous artist, the puppet entertainers were accompanied in their marionette musical comedy by a curious symphony orchestra made up of weird animated instruments that played themselves. Most of the dummy performers, which are featured in the recently completed film "Artists and Models," are about three feet high, with bodies shaped from sponge rubber and hinged moving parts carefully carved from wood. 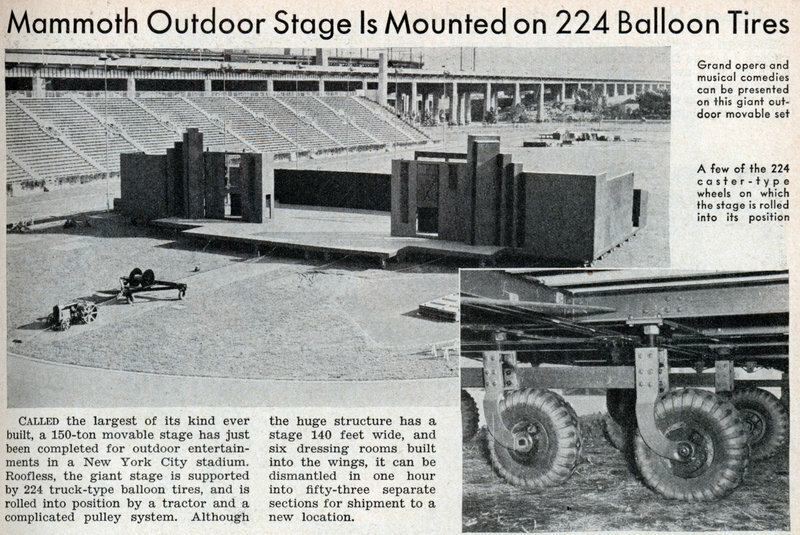 Each marionette was operated by a maze of invisible strings manipulated by groups of operators working out of the camera's range on platforms built above the stage. 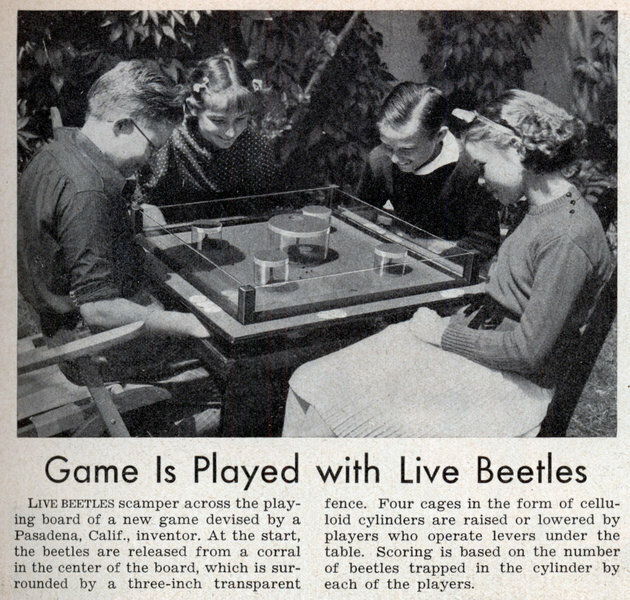 BREATHE NATURAL GAS TO PROVE IT NONPOISONOUS DELIBERATELY exposing four human guinea pigs, as well as six rats and two monkeys, to heavy concentrations of natural gas for varying periods, Dr. D. R. Drury of the University of Southern California School of Medicine has determined in novel experiments that gas as it comes from the earth has little effect on the bodies of either humans or animals. 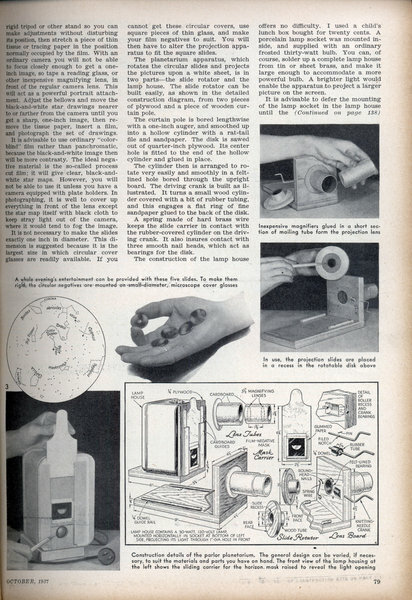 In the first test, six rats were kept in a cylindrical iron tank approximately two feet in diameter and three feet long, fitted at one end with a transparent cover. Gas taken from a domestic supply pipe, and air forced in by pump, were so mixed as to give a gas concentration of eight percent. 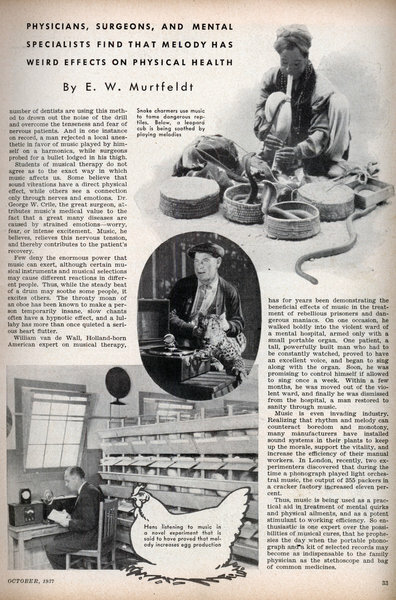 The rats lived in this mixture for thirty-six days, ate well, and on being removed were clean and healthy. A litter of new-born rats born in the gas chamber were found alive. 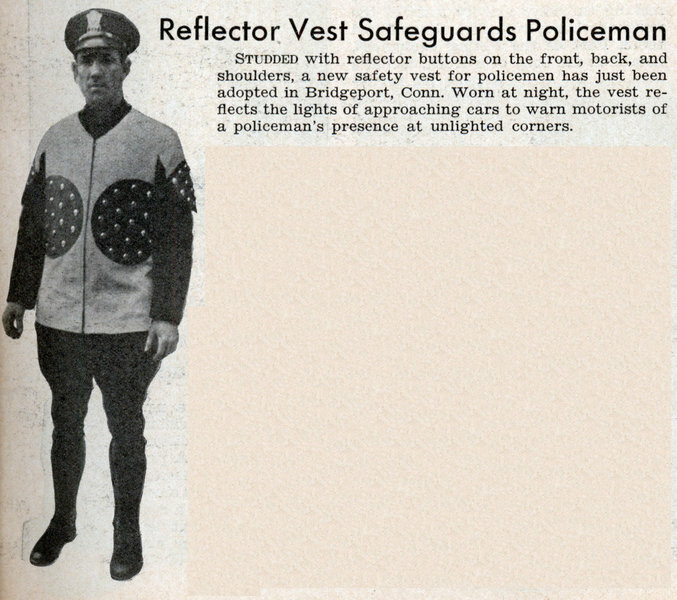 Reflector Vest Safeguards Policeman Studded with reflector buttons on the front, back, and shoulders, a new safety vest for policemen has just been adopted in Bridgeport, Conn. Worn at night, the vest reflects the lights of approaching cars to warn motorists of a policeman’s presence at unlighted corners. 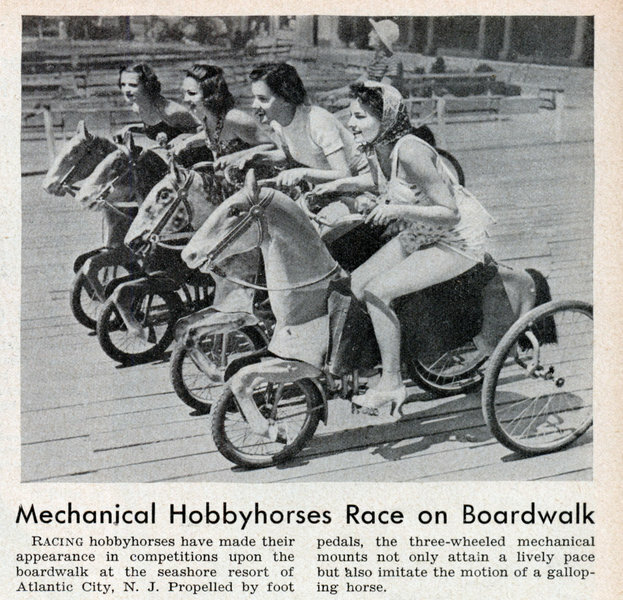 Mechanical Hobbyhorses Race on Boardwalk Racing hobbyhorses have made their appearance in competitions upon the boardwalk at the seashore resort of Atlantic City, N. J. 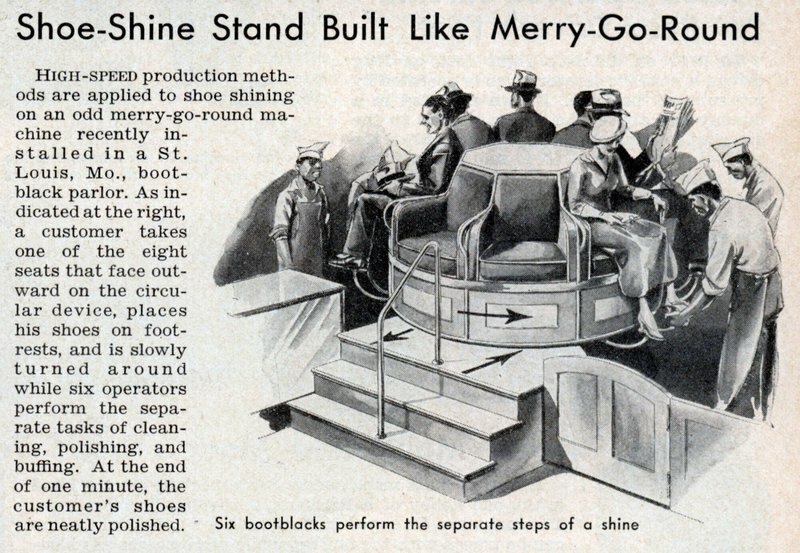 Propelled by foot pedals, the three-wheeled mechanical mounts not only attain a lively pace but also imitate the motion of a galloping horse. 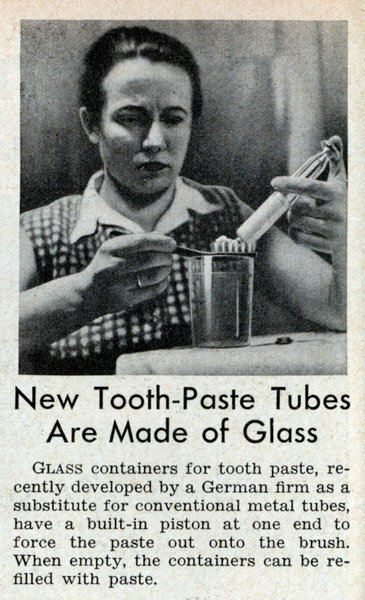 New Tooth-Paste Tubes Are Made of Glass Glass containers for tooth paste, recently developed by a German firm as a substitute for conventional metal tubes, have a built-in piston at one end to force the paste out onto the brush. When empty, the containers can be refilled with paste. 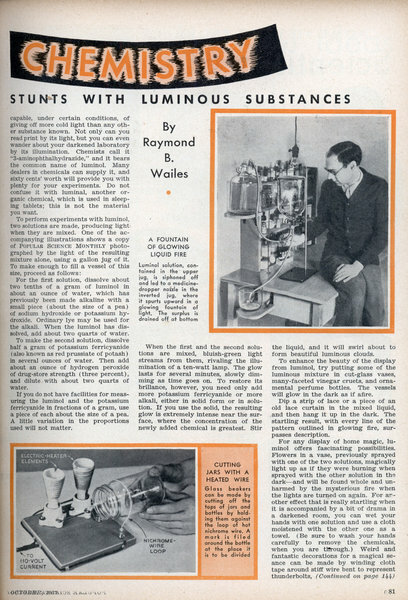 HOME-LABORATORY STUNTS WITH LUMINOUS SUBSTANCES By Raymond B. Wailes AMONG the most mysterious and beautiful of chemical experimerits are those producing substances that glow in the dark. With the aid of your home laboratory, you can make any number of common household products self-luminous. Coffee, tea, pepper, chili powder, mustard, cocoa, ginger, and many other groceries will produce a really visible light in a dark room, after you have treated them with the proper chemicals. You may even be able to make a flower from your garden emit enough illumination to allow you to read a few letters of print, and you will find that oil of bergamot, an ingredient of inexpensive perfumes, gives an especially strong glow. 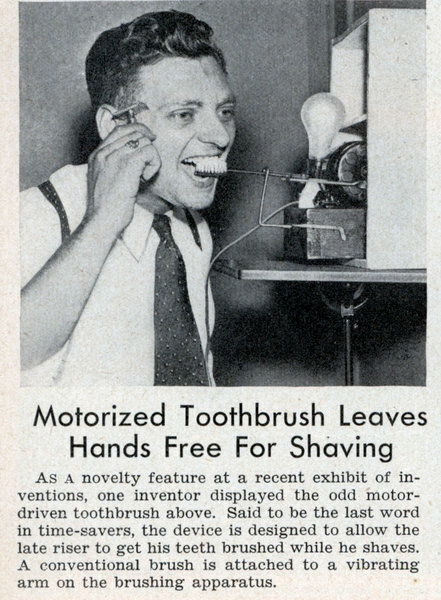 All that you will need to produce these strange effects is a little grain or J denatured alcohol, a common alkali such as lye, hydrogen peroxide from the drug store, and one of the newer, "made with electricity" bleaching liquids and laundry whiteners. There are several of these liquids, widely advertised and obtainable at any grocery store. They are solutions of sodium hypochlorite, and you will find that this statement appears on the labels of the bottles. 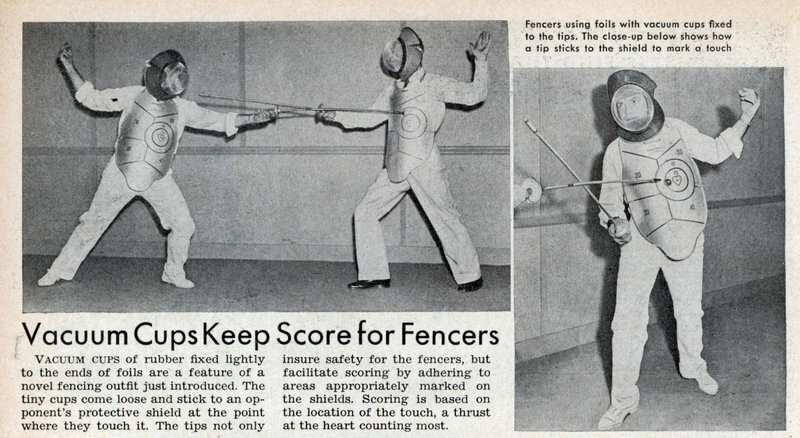 Suppose you start in by purchasing about an ounce of oil of bergamot at the drug store. Add half a teaspoonful of it to an ounce of grain alcohol, rubbing alcohol, or radiator alcohol. Also dissolve in the liquid several pieces of solid sodium hydroxide (ordinary household lye will do), or potassium hydroxide. 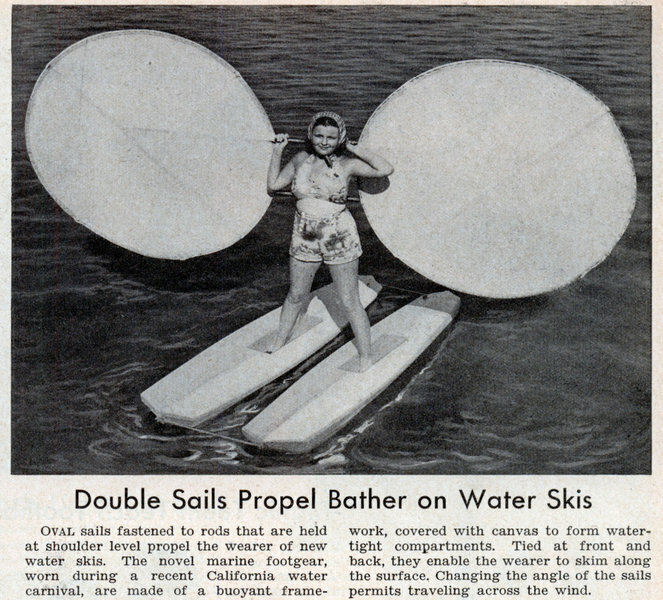 Now add about half a teaspoonful or so of drug-store hydrogen peroxide, and a like amount of the sodium hypochlorite solution. 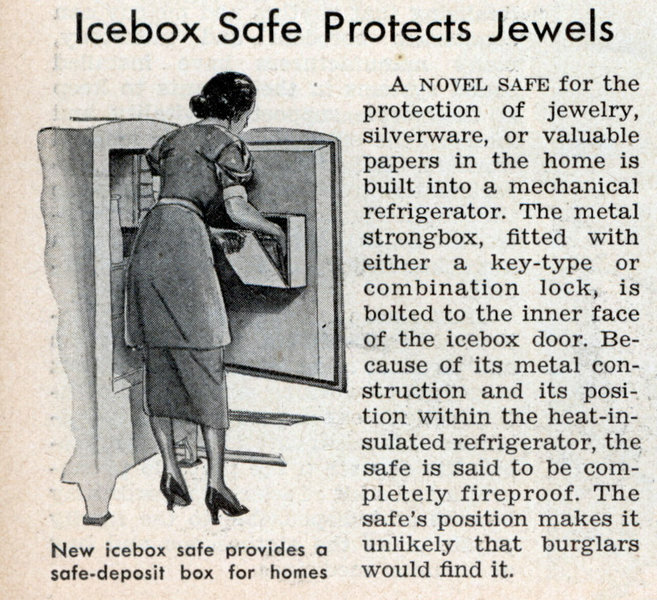 Darken the room, or take the mixture into a dark closet. PHYSICIANS, SURGEONS, AND MENTAL SPECIALISTS FIND THAT MELODY HAS WEIRD EFFECTS ON PHYSICAL HEALTH By E. W. Murtfeldt BEETHOVEN'S Moonlight Sonataâ€”three times a day. That is how doctors' prescriptions may read in the near future, according to reports from the world's leading medical centers. 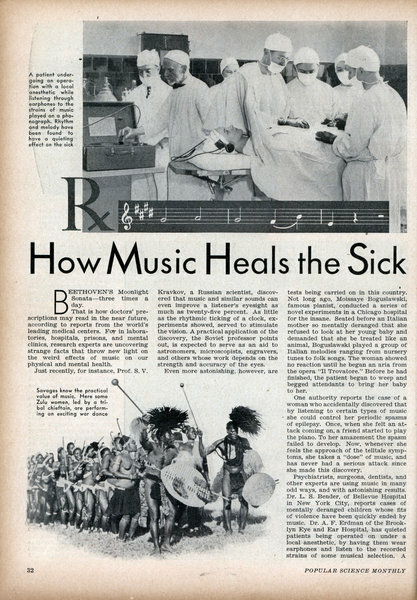 For in laboratories, hospitals, prisons, and mental clinics, research experts are uncovering strange facts that throw new light on the weird effects of music on our physical and mental health. Just recently, for instance, Prof. S. V.Kravkov, a Russian scientist, discovered that music and similar sounds can even improve a listener's eyesight as much as twenty-five percent. 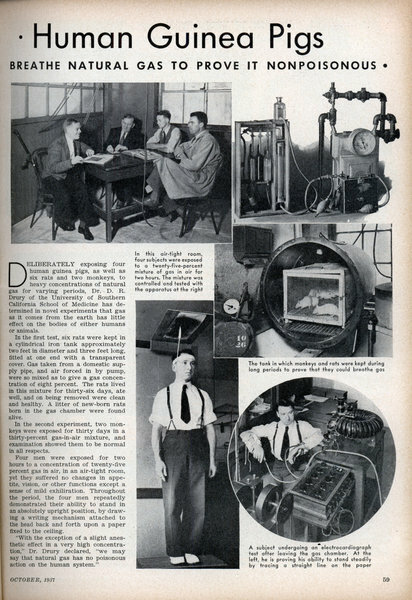 As little as the rhythmic ticking of a clock, experiments showed, served to stimulate the vision. 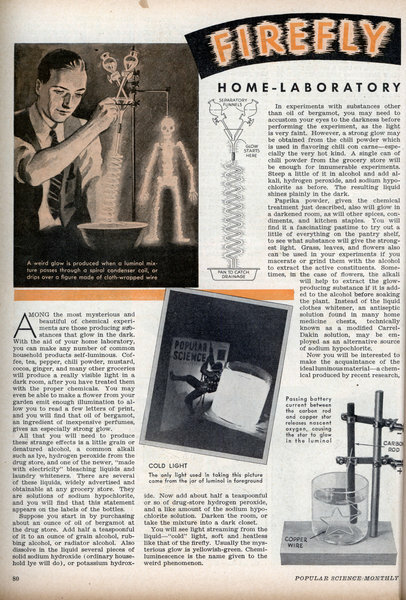 A practical application of the discovery, the Soviet professor points out, is expected to serve as an aid to astronomers, microscopists, engravers, and others whose work depends on the strength and accuracy of the eyes. 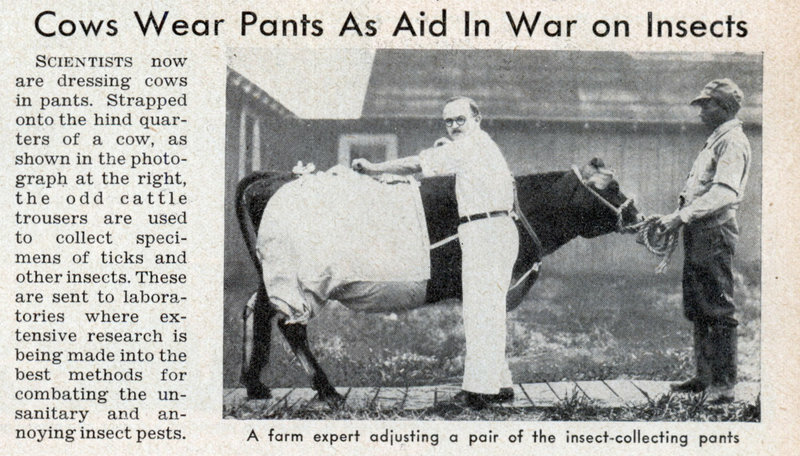 Even more astonishing, however, are tests being carried on in this country. 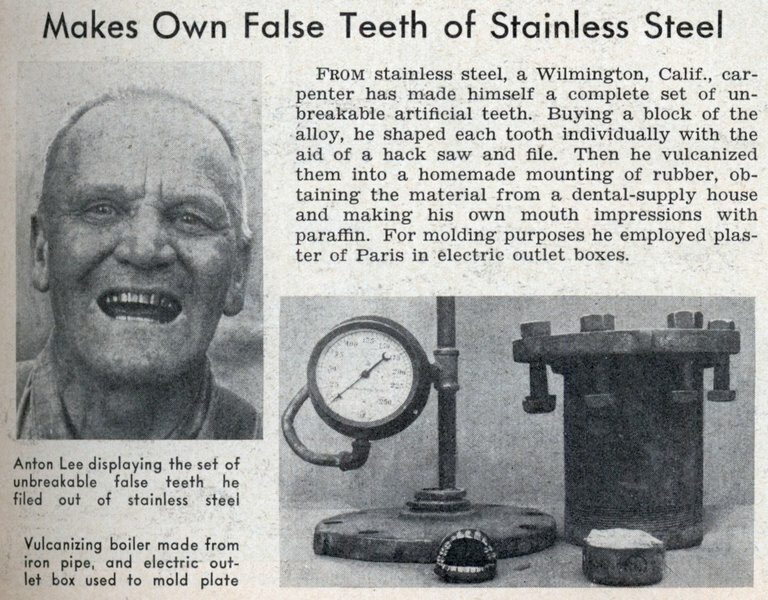 Not long ago, Moissaye Boguslawski, famous pianist, conducted a series of novel experiments in a Chicago hospital for the insane. Seated before an Italian mother so mentally deranged that she refused to look at her young baby and demanded that she be treated like an animal, Boguslawski played a group of Italian melodies ranging from nursery tunes to folk songs. 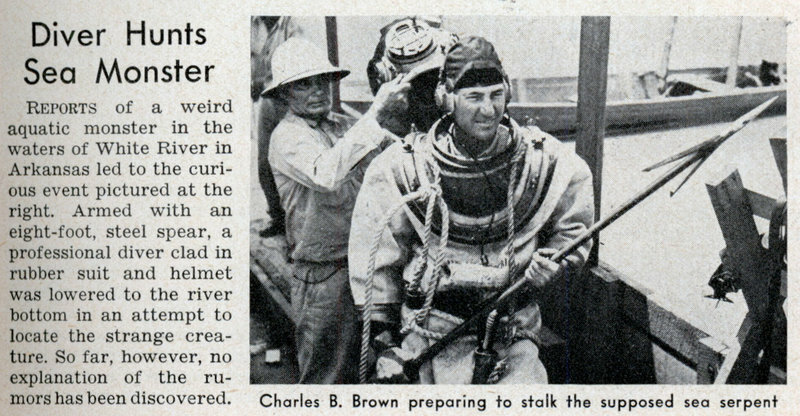 The woman showed no reaction until he began an aria from the opera "II Trovatore." Before he had finished, the patient began to weep and begged attendants to bring her baby to her. 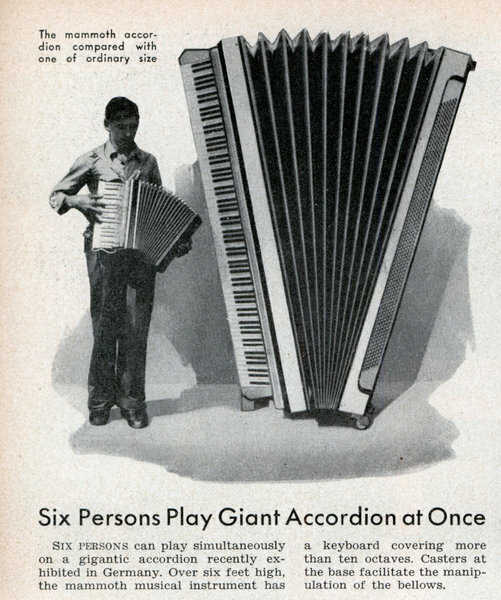 Six Persons Play Giant Accordion at Once Six persons can play simultaneously on a gigantic accordion recently exhibited in Germany. Over six feet high, the mammoth musical instrument has a keyboard covering more than ten octaves. 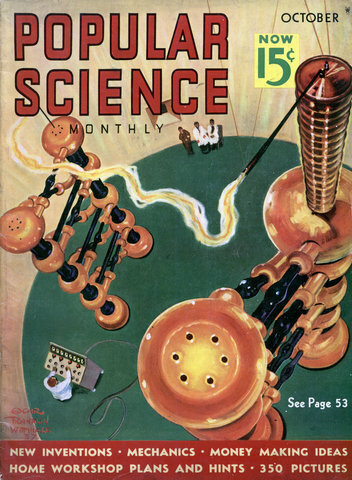 Casters at the base facilitate the manipulation of the bellows.